Hi guys! I am currently nominated for StarCentral Magazine's Female Artist of the Year category, and if you would like to vote for me, you can click this link: http://star-connect.com/polls/female-artist-of-the-year/ and vote for "Stephanie". I have the photo that is the same as the photo I am using here on my blog. You can vote once everyday and the voting period starts now and ends on the 9th of January, 2012 at 12AM AEST. 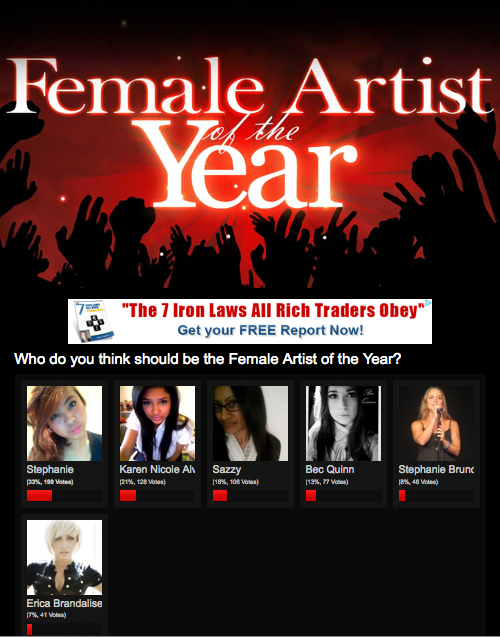 Vote for who you think should be the “Female Artist of the Year” in the poll above! The poll closes on the 9th of January, 2012 at 12am AEST and you are eligible to vote only once per day (after you’ve voted, 24 hours must pass after the time you voted, for you to be able to see the voting form and vote again the next day). Vote NOW and make your voice heard! The winner of the voting poll will be featured in the StarCentral Magazine website and will be featured in StarCentral Magazine’s February issue alongside StarCentral’s HOT list of 2011." Thank you so much for the support! Thanks to that person who nominated me without letting me know (lol and now I know -- caught you hehe :P ) and thanks to everyone who has been voting and spreading this! I truly appreciate everything! Really... I love you guys! Ikaw na peymus! Na-vote ko na yu! Hihihih. wow! iboboto din kita beautiful..
Yabang oh! Sana manalo ka, Steph. My full support to you Ms. Traveliztera. naks leading, as of today you already have 234 votes yey! actually kay glentot kita unang nabasa, pati narinig ko na rin ang boses mo, at sa mga renditions na posted don, syo ang pinaka-da-best!